The EOS M50 isn’t the first interchangeable lens EOS model from Canon to offer 4K video recording capability (that honor goes to the top-of-the-line EOS-1D X Mark II, introduced in early 2016). But it is the first camera from Canon that targets the entry-level user to incorporate 4K video, so we’ll discuss that in this article. 4K video is recorded at 3840 x 2160 pixel resolution — 4 times the number of pixels used in traditional Full HD (1080p) video. This is “UHD” compliant 4K recording, and is a near-perfect match for many of today’s 4K, flat-screen TVs. Keep in mind that this differs from the slightly higher resolution “DCI” 4K, which is 4096 x 2160 pixels — a size used more frequently in the cinema industry. High-end Canon EOS DSLRs with 4K, specifically the EOS-1D X Mark II and EOS 5D Mark IV, use this cinema-leaning version of 4K. However, for the vast majority of 4K recordings intended for online viewing, or for viewing on household 4K TVs, the 3840 x 2160 version used in the EOS M50 is probably ideal. Anyone who’s ever looked at 4K-produced content on a modern 4K, flat-screen TV will immediately understand the potential benefit of the EOS M50’s 4K video: outstanding rendering of detail and texture in moving video imagery. And, of course, original 4K video recordings from this camera can be reduced to much more manageable Full HD file sizes, using “copy” commands in various video-editing software with a compatible Windows® or Macintosh® computer. By copying a file during editing, the original 4K files remain at their original size, and can be used later with no loss of video quality. As mentioned above, EOS M50 can record 4K video at either 24 fps (actual 23.98 fps, when camera is set to NTSC-type video recording), or 25.00 fps for PAL-compatible regions. Faster frames per second recording speeds will require switching to Full HD or HD recording. When 4K recording is selected, it’s taken directly from a 3840 x 2160 pixel central area of the camera’s 24 million pixel image sensor. 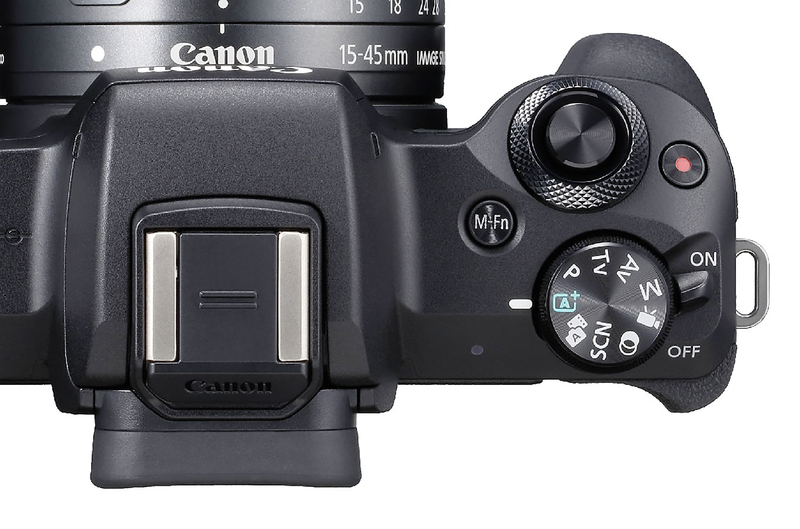 This means recording for 4K is from a cropped, central area of the image sensor — what you see in the viewfinder or LCD monitor during recording will be accurate, but keep in mind there will be a “crop effect” of about 1.67x, compared to what you’d get shooting still images with the EOS M50, or recording Full HD or HD video. If you recorded 4K video using the 15–45mm standard EF-M lens, lens coverage would be similar to what a 25–75mm lens would deliver for still images on the M50. To be clear, for technical reasons, Full HD or HD video is always recorded using the full width of the camera’s imaging sensor. 4K video is always from the cropped central area. The EOS M50 records 4K video directly from the central portion of its imaging sensor, shown above as the yellow area. This graphic is an approximate, contextual illustration, and not drawn exactly to scale. One advantage of using this smaller, central area of the image sensor for 4K recording is that it records exactly 3840 x 2160 pixels, so no “binning” or line-skipping steps occur as the 4K video is processed in-camera. 4K video is set by using menu commands in the EOS M50. But unlike more conventional Full HD or HD video quality settings, which can be selected with the Mode Dial in any position, 4K video requires the Mode Dial to be pre-set to the Video position (indicated by a small icon which looks like a video camera). Once the Mode Dial is set to Video, 4K can be selected from the Movie Record Quality menu item, in the 1st red shooting menu screen. With 4K is selected in the menu, you normally start and stop video recording using a small button marked with a small red dot, immediately to the right of the camera’s shutter button. Press this again to stop recording. Out of the box, you start and stop video recording by pressing the small button with the red dot, just to the side of the shutter button. The shutter button can be configured to be your video start/stop button… see the text immediately below. And, using the Custom Controls menu (it’s in the Custom Functions menu), the top M.Fn button, and numerous back buttons can likewise be configured to stop and start video recording, if you desire. If you want the shutter button to start and stop video, you can do that too. With the Mode Dial set to the Video setting, in the red shooting menu (screen #5), there’s an entry for shutter button function during video recording, with a small icon symbolizing the shutter button. You can define what happens when you press halfway down on the shutter button (AF active or not), and independent of that, you can define whether a full press of the button will start/stop video recording. By default, when the camera is set to Video on the Mode Dial, this is inactive. So you can change it here to make the shutter button your start/stop button for video recording. Please note that using and applying Custom Controls to change a button’s original function requires you to be in a Creative Zone shooting mode — P, Tv, Av, M — or the Video shooting setting on the Mode Dial. Custom Controls aren’t accessible in other, more automated shooting modes. Even if you applied Custom Controls while in a Creative Zone mode, if you then switch to the Full Auto green zone, or another full-auto setting, your selections for changing video start/stop are ignored. Shutter speed, lens aperture, and ISO are all set totally automatically, based on the level of ambient light at the moment. Exposure can and will shift, if the camera is panned from light to dark areas, or vice-versa. Manual exposure control, with the user setting shutter speed, lens aperture, and ISO using touchscreen commands on the camera’s LCD monitor. Once exposure is set, it won’t shift or change, until the user deliberately changes one or more of these settings. The camera’s +/- 3 stop analog exposure scale, visible onscreen, indicates the relative exposure at the moment, with the currently-applied shutter speed, aperture, and ISO. To select either, with the camera’s Mode Dial set to the Video position: either tap the Movie Mode icon on the far upper-left of the LCD screen, or go into the red Shooting Menu, and on screen #1, select SHOOTING MODE. Your choices are the two listed above. Please note that in Movie Mode, at 4K or any other video resolution setting, the EOS M50 doesn’t allow shutter-priority (Tv) or Av operation… if you set either of these on the Mode Dial, and then press the video start button, the camera will revert to fully automatic exposure for video (no user-selectable shutter speed or aperture). 4K Recording bit rate — approx. 120 Megabits/sec. Shoot 4K video, and during playback, you can stop at any point — including moving forward or backward one frame at a time, using simple onscreen icons on the LCD monitor — and select any frame to be copied and saved as a still JPEG image on your memory card. 4K video stills are saved as 3840 x 2160 still image files — about 8.3 million pixels — which is more than sufficient for most online or onscreen viewing applications. Expect these files to be about 1.5MB each in file size, although this can vary significantly. One important note: the onscreen icons for Frame Grab, advancing forward or backward, and so on don’t immediately appear if you simply press the camera’s Playback button. To see the array of icons, navigate to the actual video file you want to play back, using the left & right buttons on the round control pad on the back of the camera. Then, tap the large arrow icon onscreen to begin playing back that video file. Tap the screen at any time, as the file plays back, to halt playback, and now the small icons to control playback appear on the LCD monitor. You can tap any of them to start the editing or Frame Grab process. For technical reasons, Canon’s outstanding Dual Pixel CMOS AF technology cannot function during 4K video recording (it is fully active when video resolution is set to Full HD or HD), so the EOS M50 has to default to contrast-based AF detection. This means a process where the camera reads sharpness off the imaging sensor, but without the electronic aids provided by the Dual Pixel AF system. Realistically speaking, you can expect the EOS M50’s AF during 4K recording to be somewhat slower and without the crisp response you may be used to when the Dual Pixel CMOS AF is available. It’s also possible to shoot video frames at slower rates, to produce in-camera time-lapse movies. Many previous Canon EOS cameras required the shooter to dial-in a specific interval for each video frame, and then set a total number of frames to be recorded (this would then dictate the length of time required to record the time-lapse video, and the length of time required to play it at a conventional 30 fps). 15-second interval automatically applied — for slower moving subjects, such as setting sun, etc. A huge and fundamental control, to impact how color and contrast are rendered, as well as the level of in-camera sharpening. All seven factory-supplied Picture Style options can be set, as well as three extra spaces for User-defined Picture Styles to be applied. Like all recent Canon EOS cameras, when recording video, Sharpening is limited to the Strength only (0~7 on a scale); the added Fineness and Threshold fine-tuning settings are for still image shooting only. All White Balance settings can be applied with the EOS M50 during 4K video, including the White Priority AWB setting, Custom WB, and setting WB in degrees Kelvin. Further fine-tuning of any of the White Balance settings, to deliberately add small amounts of Magenta, Green, Amber, or Blue. This menu setting gives four options (Off thru High), to increase brightening of shadows and other dark areas in a scene. Unlike most previous EOS cameras, the EOS M50’s Auto Lighting Optimizer (ALO) also adds management of bright highlight areas, so that lighter areas can sometimes minimize risk of washing-out in bright sun or under other harsh, contrasty lighting. Another menu setting, which will deliberately dial-down the brightness of detected highlight areas that may be on the verge of washing-out from being too bright — without darkening the rest of the picture. Highlight Tone Priority can be an essential quality feature for video, especially if combined with the Neutral Picture Style…the two combine to reduce contrast, and make detail more prominent in both light and dark areas of a scene. Keep in mind that for technical reasons, you can’t combine Auto Lighting Optimizer and Highlight Tone Priority; only one or the other can be active at one time. This is in-camera stabilization, which is particularly effective at countering the lower-frequency but broad movements types of “shake” which often occur if the camera operator is walking or jogging to follow a moving subject. Think of reality TV-types of video recording, which are often used today by vloggers and in many other types of online videos. Movie Digital IS can be set to “Enable” or “Enhanced;” the latter provides more extensive shake-correction for these large types of camera movements. Movie Digital IS can be combined with the optical IS built into many Canon EF-M, EF-S, and EF lenses*. If both are active (the optical IS in compatible EF-S and EF lenses is turned on/off by a switch on the side of these lenses), the stabilization effect is even more effective in many types of 4K video recording, when a solid tripod isn’t practical. The inclusion of 4K video capability in the EOS M50 makes it even more desirable as a camera for vloggers and video enthusiasts, looking to step-up from either a smartphone or a pocket digital camera. It’s absolutely true that there are some limitations the video user should be aware of when the EOS M50 is set to record 4K, such as the switch-over to contrast-type AF, 24 (or 25.00) fps recording only, and the crop factor that’s not present during conventional Full HD and HD recording. But within these limitations, the EOS M50’s 4K adds another way to get very detailed, high-quality video, when a high-resolution original video source file is needed. And, the ability to further enhance these detailed videos with the full range of Picture Style choices, and specialized image controls such as the Auto Lighting Optimizer or Highlight Tone Priority, mean that the quality-conscious video user now has a compact and relatively affordable 4K camera option in the Canon EOS system.